Boater&apos;s Paradise. Beautifully Furnished Two Bedroom Two Bathroom Condo Features Tile Flooring Throughout, Crown Molding, Recessed Lighting, Private Balcony Accessed From Both Living Room and Master Bedroom. Master Bathroom Offers Dual Vanity With His/Her Sinks, Jacuzzi Tub, Separate Stand Up Shower and Walk In Closet. Unit Complete with Covered Assigned Parking and Deeded Boat Slip. Walker Key Is Perfectly Situated On Peaceful and Serene Terry Cove in Orange Beach. Surrounded By Picturesque Waterways, Bays, Canals and Lagoons of the Alabama Gulf Coast. 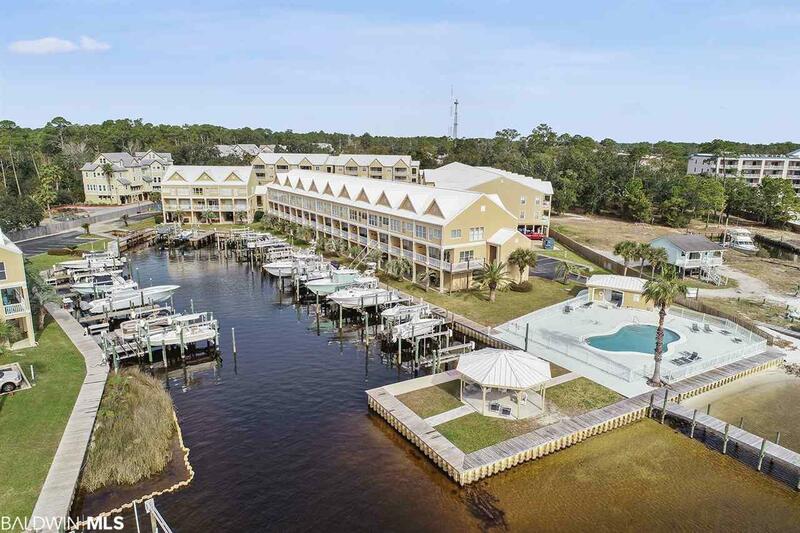 Amenities Include: Two Outdoor Pools, Gazebo, BBQ Area, Fishing Pier and Marina. Conveniently Located and Just A Short Distance To Schools, Restaurants, Shopping, Beaches and More. Don&apos;t Miss Your Opportunity To Own A Piece Of Paradise. Home Inspection available upon request.